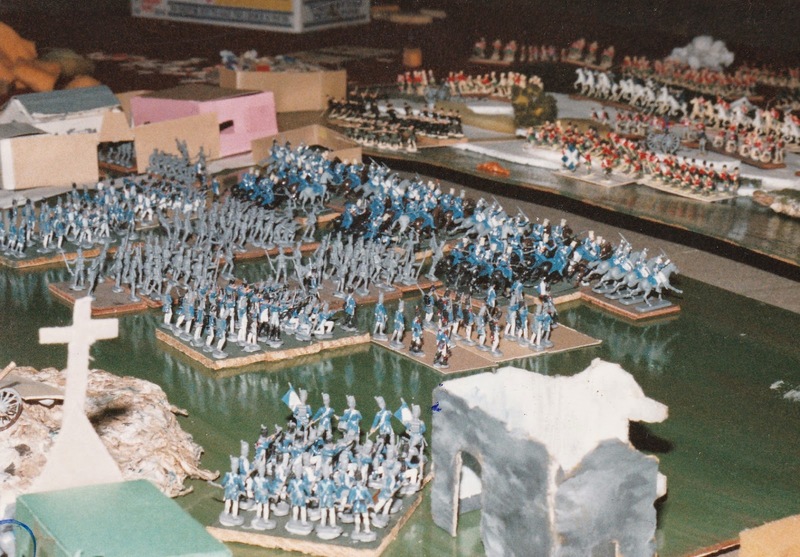 I was going through some old photographs and found the following pictures of my formative years as a wargamer. 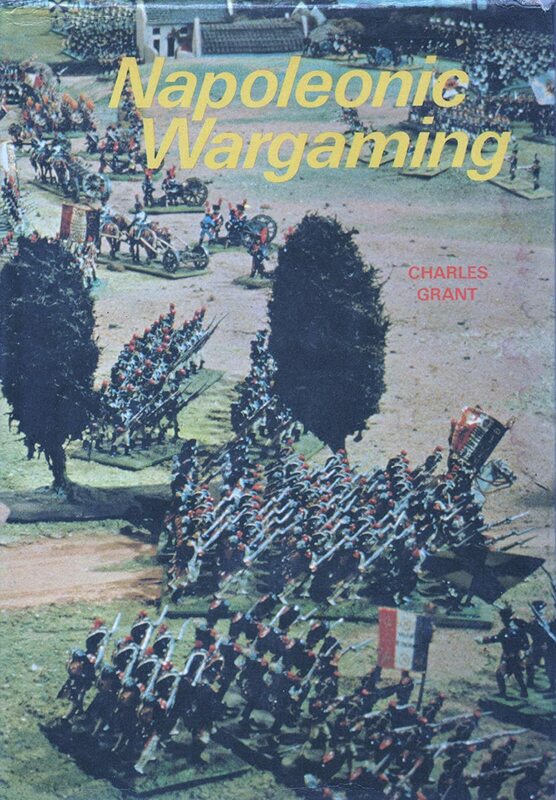 When I was first introduced to wargaming at school, I already had a massive collection of plastic Napoleonic figures, mostly Esci figures, but also some Airfix thrown in for good measure. One day, my friends and I put this collection to good use by re-fighting Waterloo and the pictures below are of that event. First of all, the pictures need an explanation. I don't remember the rules we used, but I know that we were inclined to remove individual casualties, so none of the figures were fixed to bases, except by blu-tack. 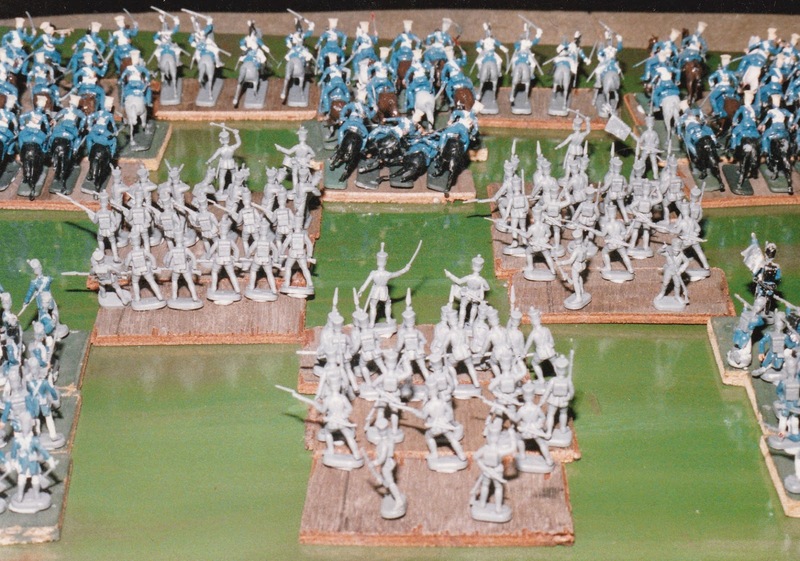 I got the idea of basing figures from an early book on Napoleonic Wargaming, (maybe the one by Charles Grant?) but missed the point that figures were not supposed to be taken off bases. So we would spend several hours before each game, blu-tacking the figures to the pre-cut bases that I had. 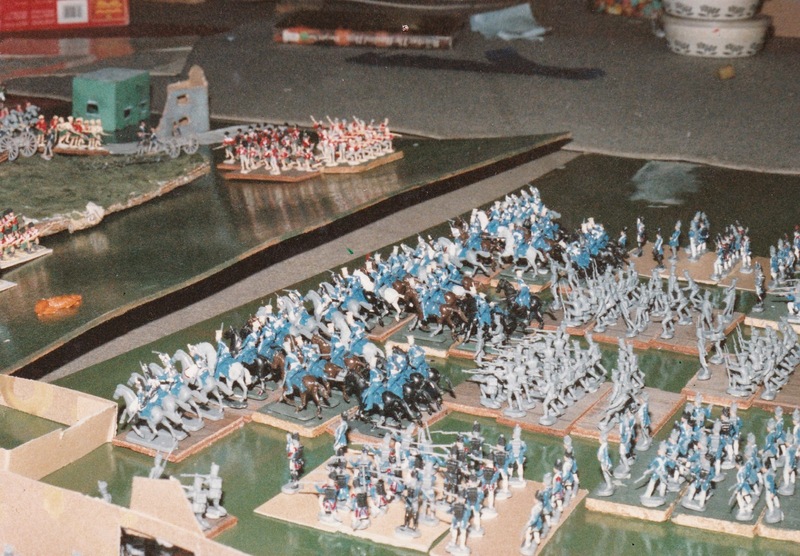 On top of this, I used to stick the figures to the bases in a specific order, each unit consisting of about 25 figures or half the box. This is why there is a some uniformity to the poses on the bases. Plus I never had the time to paint every figure in my collection and this is why the board is full of unpainted figures, a strict no-no these days. We had two chip board door panels that we used as boards, one of these had been painted with gloss green emulsion and had warped, the other, thankfully, remained flat. 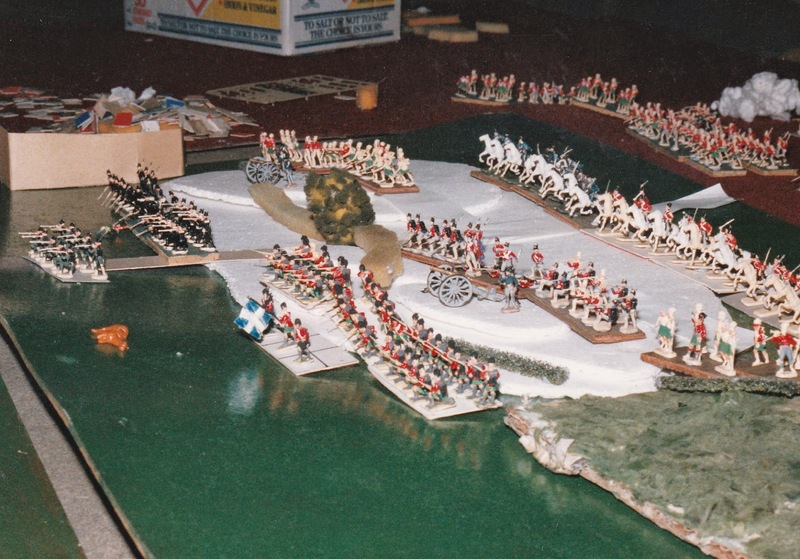 The terrain was all hand made but half-finished as I never had enough green paint to paint the polystyrene hills that formed the British ridge. 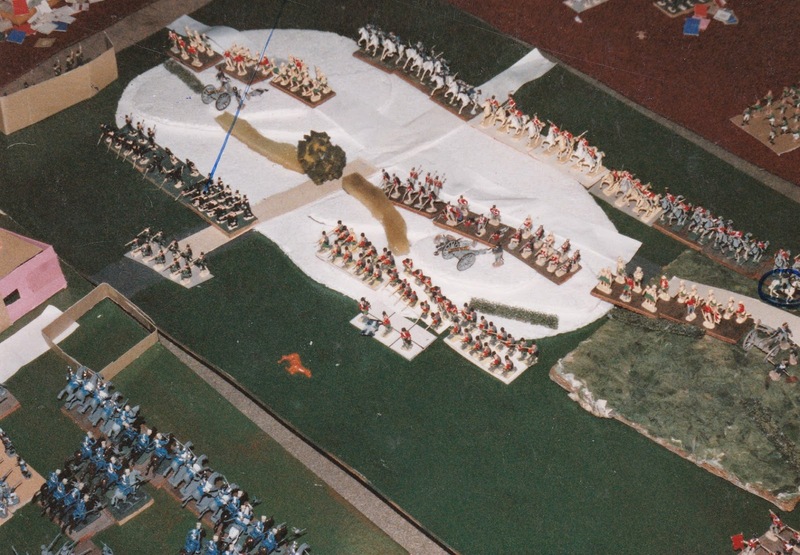 All the buildings were hand made from cardboard, including a cut-out from an early copy of Miniature Wargames. So with that in mind, let's have a look back at 1988 and the Battle of Waterloo. 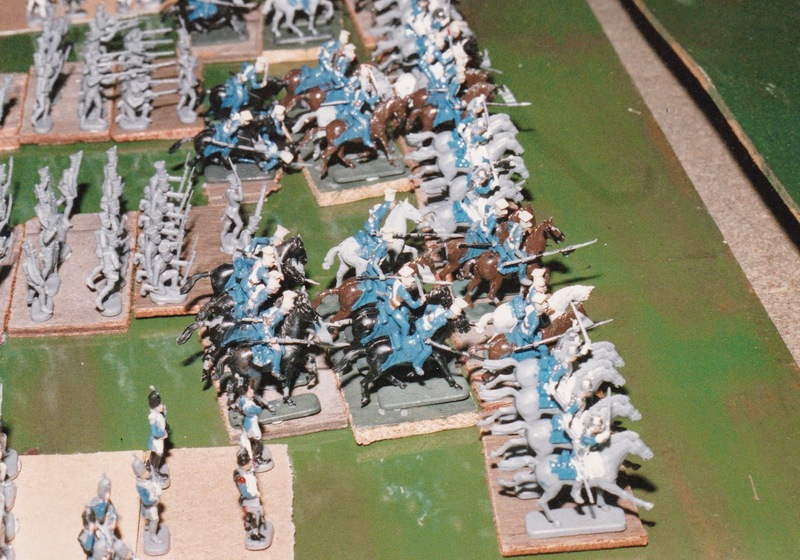 This screen of cavalry was made up of Polish Lancers and Cuirassiers.Some of which were painted, some weren't. Another overview, looking from the British line back towards the French attack. 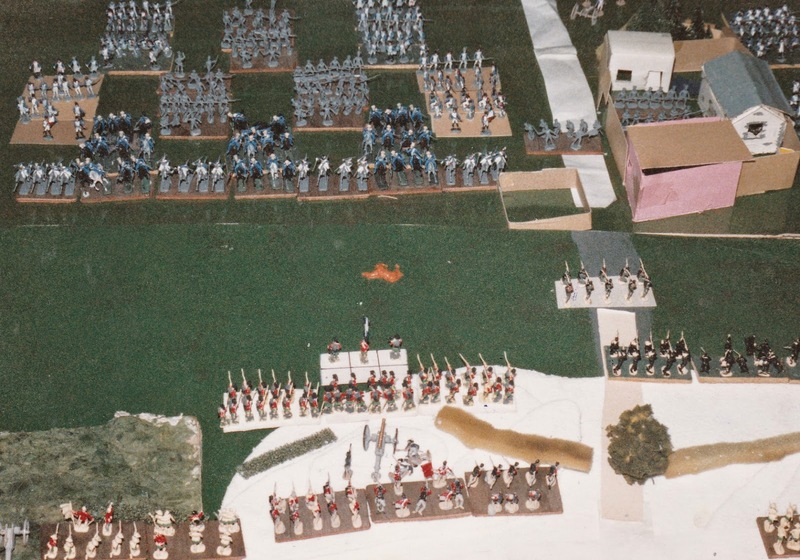 In the centre right, the 95th Rifles have fallen back from the sandpit next to La Haye Sainte, just in front of the Brunswicks (painted in black uniforms). Rather than having actual figures in the proper uniform for both of these units, I just repainted the normal British infantry in Green and Black respectively. The buildings on the edge of the British line are supposed to be Mont St Jean. The following picture gives you an idea of the amount of figures I used to own. Another shot across the British positions, showing the cavalry waiting behind the crest and the thin red line. Wellington's horse can also be seen on the right edge of the photo, circled in pen. Finally, another picture of the British positions, you can also see the reserves waiting off table to be brought on at some point. I didn't take any more photos during the game, so all I have a record of what happened about half way through. However, I do remember that it was a French victory and as we didn't have rules for morale, the entire British army was wiped out to a man. Most games were fought to the death in those days. Also, I don't remember if this was part of a campaign, but I know we re-fought Quatre Bras, Wavre, Ligny and some of the rear guard actions of the 100 Days campaign, so this may have been part of that ongoing effort. These were great days and my only regret is swapping the entire collection of figures for some plastic WW2 figures! Some of those Esci miniatures look familiar. Mine are sadly long gone now. I used to play solo games with models blue-tacked to cut-out sections of cereal packet although I never got around to painting them. My first 'wargaming' experiences in fact! Thanks Gaz. Yeah, I remember all the poses of the figures well. What I would do with the collection if I still had it! It's funny how many people have said they did similar activities as kids. Fantastic stuff. I would have had a similar set up with Airfix plastics in 1976. All unpainted, although I did have the Airfix la Haye Sainte and a Hougoumont made from plasticard from plans in Military Modelling. Well done for photographing yours! Excellent, I'm glad you liked it. It sounds like a lot of us had similar set ups! Brill, several early rulesets had unpainted figures in their illustrations. Thanks, that's true, I don't feel so bad about unpainted figures in these pictures now!